There are 9 Assisted Living Facilities in the Paso Robles area, with 8 in Paso Robles and 1 nearby. The average cost of assisted living in Paso Robles is $4,195 per month. This is higher than the national median of $3,346. To help you with your search, browse the 17 reviews below for assisted living facilities in Paso Robles. On average, consumers rate assisted living in Paso Robles 4.1 out of 5 stars. Better rated regions include Atascadero with an average rating of 4.4 out of 5 stars. Caring.com has helped thousands of families find high-quality senior care. 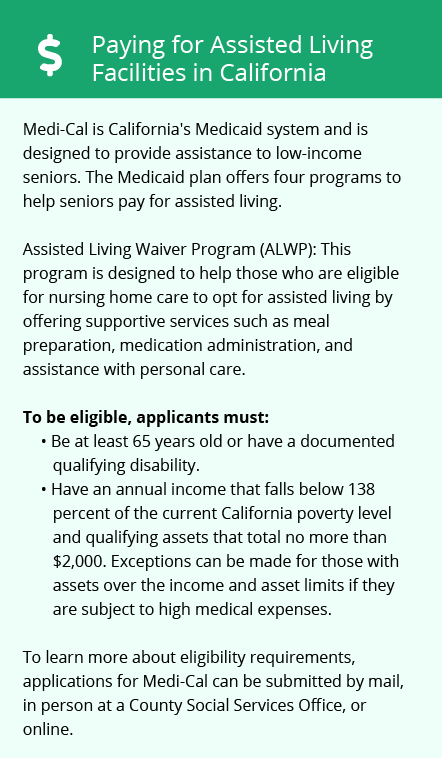 To speak with one of our Family Advisors about assisted living options and costs in Paso Robles, call (855) 863-8283. Paso Robles is a small community in the rolling grassy hills above San Luis Obispo. Home to just 7,600 people, a little under 19 percent of whom are seniors age 65 and over, there are just nine assisted living facilities in and around Paso Robles' city limits. Seniors in these facilities get help with regular activities of daily living (ADLs), but can still live with as much independence and privacy as their health allows. As residential care facilities, all of Paso Robles' assisted living communities are licensed through the California Department of Social Services' Community Care Licensing Division. The weather in Paso Robles is part California coastal/part inland hill country. Dry summers see average highs of 93 degrees during the hottest months, when heat-sensitive seniors may have trouble being outside for extended times. Cool winters produce average lows of 34 degrees, when roughly 13 inches of rain fall over the area. The cost of living in Paso Robles is about 49 percent above the national average for all common expenses. Housing is especially expensive here, with a median home value of nearly $500,000, though other expenses are less severe. Healthcare, for example, costs just 88 percent of the national average in Paso Robles. Paso Robles' crime rate is roughly 15 percent lower than the national average across all crime categories. Violent crime is less common, though property crimes, such as theft, remain close to the average nationwide. The San Luis Obispo Regional Transit Authority operates Paso Express, which provides limited services toward the southwestern edge of Paso Robles. With just two routes, both of which connect to the larger community of San Luis Obispo, public transportation in the area is limited. Seniors qualify for a discount on Paso Express with valid ID. The Paso Robles area is home to world-class medical facilities, including those specializing in brain health and dementia care such as Twin Cities Community Hospital and French Hospital Medical Center, in the event of medical emergencies or illness. Paso Robles area has an array of community resources for seniors, including the Central Coast Commission for Senior Citizens, an organization that connects seniors with free or low-cost transportation, legal aid, meal services and home repair services, as well as three senior centers. Assisted Living costs in Paso Robles start around $4,195 per month on average, while the nationwide average cost of assisted living is $4,000 per month, according to the latest figures from Genworth’s Cost of Care Survey. It’s important to note that assisted living rates in Paso Robles and the surrounding suburbs can vary widely based on factors such as location, the level of care needed, apartment size and the types of amenities offered at each community. 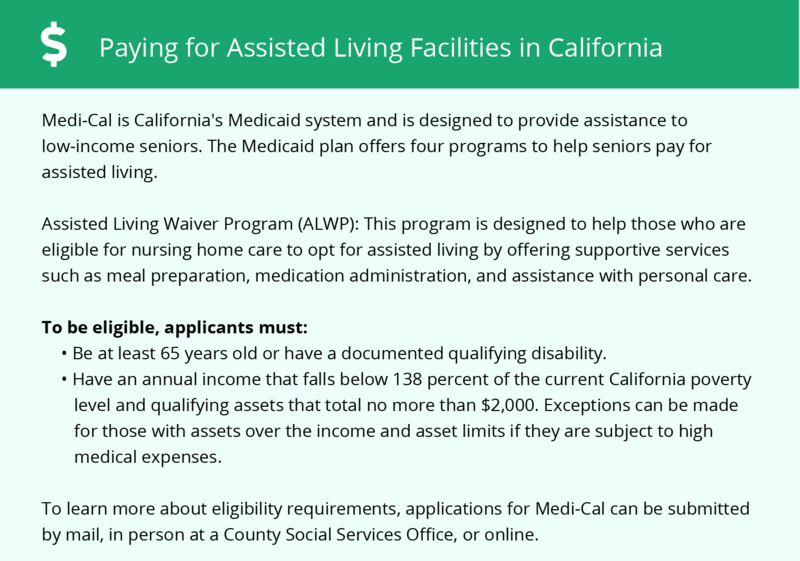 San Luis Obispo County does not participate in California's Medicaid waiver program, but the Paso Robles Community Development Department does administer a community block grant that helps cover some of the cost of operating assisted living facilities. To see a list of free assisted living resources in Paso Robles, please visit our Assisted Living in California page. Paso Robles-area assisted living communities must adhere to the comprehensive set of state laws and regulations that all assisted living communities in California are required to follow. Visit our Assisted Living in California page for more information about these laws.